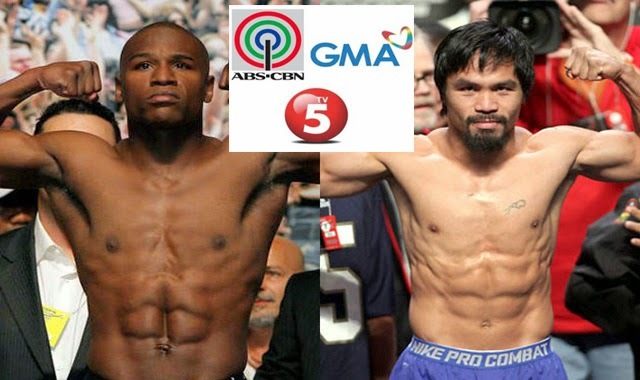 GMA Network holds an exclusive contract with the Filipino Boxing Champion Manny Pacquiao and has the right to exclusively show his fights on Philippine TV, however, with the upcoming fight of Pacquiao against Floyd Mayweather Jr. on May 3, 2015, GMA will share the rights with TV5 and ABSCBN Network. The three giants rival networks are making an unprecedented simulcast to cater to all the Filipinos all over the country. GMA Network welcomes TV5 and ABSCBN on March 26, 2015 as the three networks reveal the rare partnership Philippines had ever witnessed. According to the official staement of GMA’s CEO Felipe L. Gozon as read by Executive Vice President Felipe S. Yalong during the news conference, GMA is waiving their exclusive rights for Pacquiao’s fight to make each Filipino share the moment of the historic mega fight. It has also been revealed that it was Manny Pacquiao himslef whopersonally pushed for the three TV networks to unite in the broadcast. The Filipino Boxing Icon thanked the networks the Solar Entertainment for making the simulcast possible. He thanked the GMA, TV5 and ABSCBN for uniting and reaching an understanding so all the Filipinos can watch the fight together. Yalong said that Pacquiao had personally requested for it. He then shared that the boxer’s contract indeed is exclusive to GMA network but with the mega-fight, dubbed as the fight of the century, Filipinos are given the opportunity to watch it in their chosen channel. On the other hand, Chot Reyes of Sports5 shared the excitement of his network with partnering up for the telecast of the megafight. ABS-CBN integrated sports head, Dino Laureno, said that the event was an opportunity that was hard to pass up.